We are pleased that you are visiting our website. On this website you will find current and comprehensive information, activities and documentation for: the $184 million bond referendum for the Hidalgo County Drainage District #1; the activities of the Drainage Advisory Committee; and, the Hidalgo County drainage system. 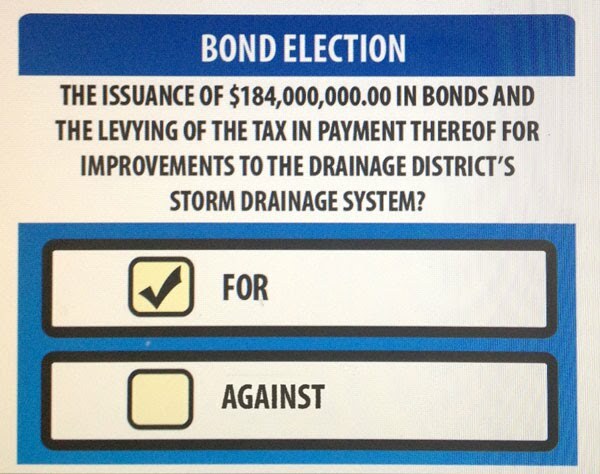 On November 6, 2012, Hidalgo County voters approved the bond referendum with 75% of the voters in favor of the drainage board of directs issuing $84 million in bonds and leveraging a $100 million federal grant to fund 25 specific projects in the County. These monies will improve the County's drainage system, move storm water runoff out for the County faster, and by doing so these improvements can help protect the safety of our communities and over $35 billion in property assets. Please check out the Vote For Drainage Facebook page. A 25-member Drainage Advisory Committee was created by the Board of Directors of the Hidalgo County Drainage District #1 to serve as an advisory group to the Board. It is the intent of the Board that the committee serves as a link between the stakeholders and constituents of Hidalgo County and the Board related to the development, planning, financing and implementation of the Drainage District’s Capital Improvement Plan. Use the navigation links on the left side of each page to review any part of this website. If you have any issues with the website, please use our Contact page to send us a message and we will assist you as soon as possible. Thank you again for visiting.